Geneva – Ahead of International Day for Disaster Reduction on Saturday 13 October, IOM, the UN Migration Agency, releases an annual progress report on disaster risk reduction initiatives supported by a global video of DRR practitioners. Natural hazards and disasters, exacerbated by a variety of risk factors, including accelerated urbanization and population growth, are expected to displace millions of people every year within their countries of origin and across borders. In 2018 alone, there were 18.8 million new internal displacements associated with disasters in 135 countries. Disaster Risk Reduction (DRR) aims to reduce the damage caused by natural hazards such as earthquakes, floods, cyclones and droughts. IOM takes part in global DRR efforts by strengthening the capacity of communities at risk, especially for displaced and other vulnerable mobile populations. Last year, IOM implemented 84 DRR projects in 71 countries, reaching approximately 1.4 million individuals. Initiatives included risk assessments, livelihood support, climate adaptation strategies and early warning systems, among many others. IOM also provided disaster risk reduction trainings to more than 28,000 community members and over 6,400 government officials. “Our projects help people understand that they have their own responsibilities in the management of disaster risks in their communities,” said Jain Emmanuel Noel, IOM Haiti Programme Officer. Noel was one of nine IOM staff members who collaborated across six countries to create the video, IOM and the Sendai Framework: Reducing Disaster Risk and Promoting Resilience. The video shares the many ways in which IOM projects build resilience and preparedness in disaster-prone countries. “They need to enhance the capacities so that they can address, by themselves, the needs they are facing in their communities,” added Mr. Noel. In Haiti, preparedness at the community level has been central to DRR projects. 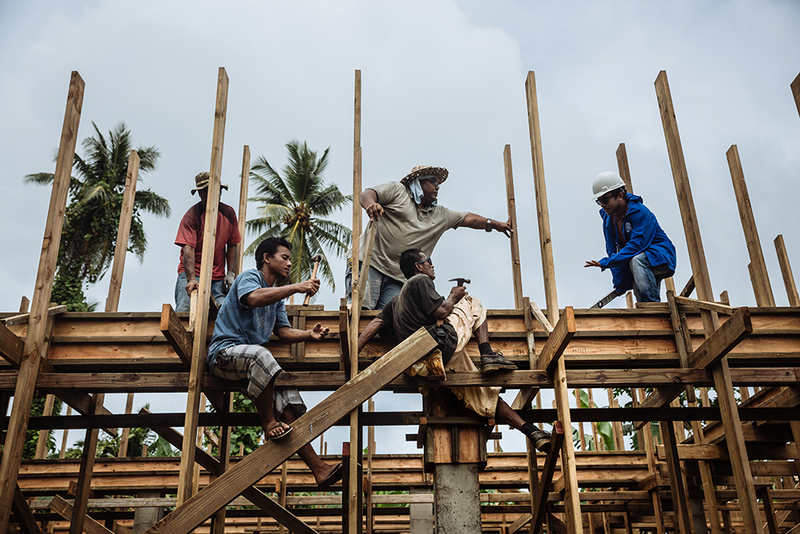 In the aftermath of Hurricane Matthew, which devastated the country in 2016, IOM trained carpenters to build houses more resilient to hurricanes and other hazards. IOM contributes to the efforts of individuals, communities and States to reduce risk, prevent disaster displacement and promote resilience. The Organization’s work on DRR and environmental degradation advances mobility-based strategies in disaster prevention and preparedness, as well as supports ‘build back better’ goals in the recovery phase. IOM contributes to the implementation of the Sendai Framework for Disaster Risk Reduction, a 15-year plan endorsed by the UN General Assembly in 2015. The 2018 progress report, Taking Sendai Forward, measures the progress of IOM in achieving benchmarks laid out in the Framework and the UN Plan of Action on Disaster Risk Reduction for Resilience. The report highlights how IOM increasingly works on mobility and disaster risk reduction issues as part of an integrated, system-wide effort alongside UN and other partners. The report further draws attention to significant humanitarian and development implications that disaster-related population movements will likely have for Governments and communities in the years to come – underlining the importance of including migrants and mobility issues in DRR and development planning. “IOM will continue to work with countries to reduce vulnerability and strengthen resilience, while promoting the vital benefits and opportunities that mobility can bring, when safe and dignified, for those seeking a better life,” concludes the report.